Aujourd'hui j'ai le plaisir d'accueillir un article invité d'une blogueuse anglophone récemment arrivée sur Lyon et qui est tombée sous le charme de la ville des lumières. L'article est en anglais et j'espère qu'il sera utile et apprécié par les touristes internationaux, de plus en plus nombreux à venir chaque année pour découvrir notre patrimoine. Voici donc la liste des lieux les plus sympas pour faire un picnic à Lyon. When coming & living or visiting Lyon, the whole experience can be a bit expensive so the more you can save, the better it is, right? I would like to recommend you a budget lunch option which you can have in Lyon. The lunch which can be healthy & cheap and so enjoyable. 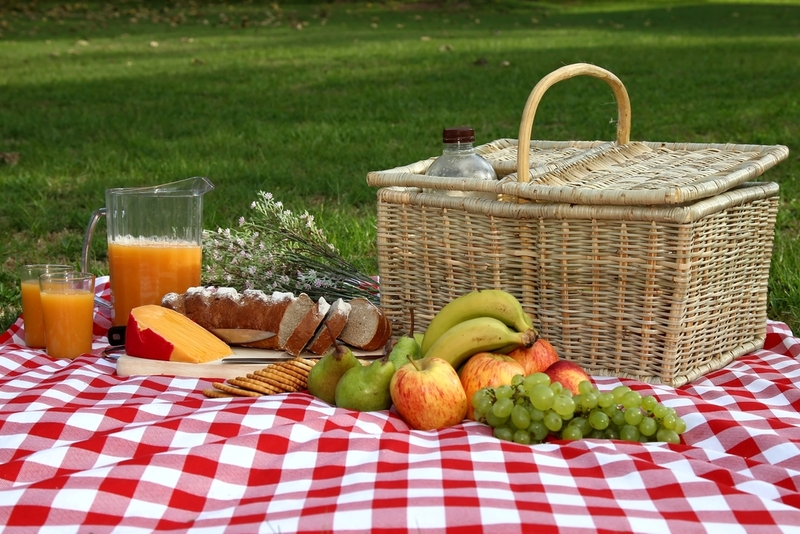 I would like to suggest you having a picnic in Lyon and I will tell you what are the best picnic spots are to have this lunch on a budget! So check out the List of the Top 10 Picnic Places in Lyon, have plenty to choose from and enjoy eating outdoors, on your own or with others! 1- Parc de la Tête d'Or - The best park of Lyon, the biggest French park! It is an ideal place for the picnic! It is not only beautiful but also have many places you can choose to have your picnic. It can be in the rose - garden or on one of the banks from which you can observe beautiful deers and other animals of the Lyonnais Zoo. You can choose the picnic on a blanket under the tree. There is also a nice area next to the lake so you can have a beautiful view when eating and avoid crowds. Yes, bear in mind that the park gets busy especially over weekends. 2- Parc de Gerland - This is another very big park of Lyon but less crowded. So this is a good news for people who look for some privacy and some peace. Yes, you can find it here as there are many hidden corners which you can use for your lunch. Once eaten, take an advantage from all what the park is offering. There is a proper skate park inside, there are beautiful gardens: few with flowers and one with the birds. There is also Maison des Fleurs. which is a 400 m² villa. Here you can learn about gardening. It organizes workshops and share many information with visitors. So it can be a very interesting experience. 3- Le Parc des Hauteurs - When you happen to be at the Fourvière Hill, I would recommend 2 main places to have a picnic in. There is a beautiful Park of the HIghests which will offer you an amazing panoramic view of all Lyon parts. You just need to find an empty bank or share one with others so you can keep eating and admiring the view. After your picnic, you can get more active and follow one of the parks paths and discover other views of Lyon. I would recommend “Tramway des Macchabées” route and the 600 m "Quatre Vents" (Four Winds) in the Viaduct path. First enjoy your picnic, then have a walk if you wish. 4- Ancient Theatre of Fourvière is an another place up on the Fourvière Hill which you can try out for your picnic. I love it. There is such an atmosphere, there is wonderful view and you are sure you will find a free seat up there. After your picnic, you can visit the Musee Gallo Romain which is just next to the theater. 5- Rives de Saône & Pavillon des Rives de Saône - this is a very good spot for picnic. Well, actually you can find many spots to rest and have a picnic at the banks of Saône. It offers beautiful walk by the river, it offers nice views and a breeze and many seating spots indeed. What i would recommend is to go a little further...if you have more time and y ou dont mind having longer walk - start it in the Center of Lyon and try to reach the Île Barbe. You will be rewarded! This is a small and cosy island on the river, where you can find peace and proper rest, and what is the highlight of the island...I would say it is the fact that this is located just next to the best Lyonnais bakery - Jocteur Boulangerie. So you will get for your lunch, the best French bread and the best dessert ever! 6- St Jean archaeological garden - this is a really good solution for having a lunch in the center of Lyon, in the Vieux Lyon. Yes, the area offers many restaurants and bouchons which you should try out but also you might want to have a lunch on a budget and simple salad or sandwich quickly, so I would recommend going behind the St Jean cathedral in Vieux Lyon. There is a small garden which presents the remains of the religious buildings and there is pretty quiet in comparison to the whole area of Old Lyon. 7- Garden of the Musée des Beaux Arts - This is an ideal picnic spot if you happen to be in the center of Lyon, next to the Terreaux. There is the Museum of the Fine Arts which has free to enter beautiful, classic garden. It is quite small but also not that crowded so you will find a free seat to get your lunch. You will get the peaceful atmosphere and some privacy and you will escape from the busy streets and loud crowds. So enjoy your lunch in the 19th century park. Eat, admire the lovely fountain in the centre and a small statue of Apollo and appreciate the art that surrounds you. 8- Place Bellecour - it is also a good solution to have a quick lunch on a budget. I dont think you will get a blanket out but you can find a comfy bank to sit in and there are many nice shops where you can buy your take away lunch. Its good if you dont mind crowds, as this area is pretty busy with tourists and the OnlyLyon office. But the huge square offers you the free toilets near by and beautiful view. So it is worth further consideration, isn’t it? 9- Banks of Rhône River. This walking park is beautiful and very big. It is spread out over 5km and offer many banks, many green spots and the beautiful views and the peaceful atmosphere. You will get here some privacy for sure as well as you will be able to avoid crowds of the busy center of Lyon. 10- Confluence Museum Park - This is new. This is located far away from center but I am sure you will end up there at some point. The new and lovely park is located behind the Confluence Museum. It offers really comfortable seats and beautiful view of the 2 rivers joining together. It is not a big park but works well as a place to relax, rest and have something to eat. So how do you like my selection of the Top 10 Places For Picnic in Lyon? I could share some more with you as i keep exploring but I am sure you have some ideas as well. I would love to hear them so i can try out new places myself. In the meantime, if you run out of the ideas for picnic, I would recommend checking my shopaholicfromhome.com blog where i keep discovering Lyon and France. So...bon appetit!